The Peavey Audio Performer Complete PA System is a fantastic package offering everything you need for small venues such as open mic nights and intimate performances. The package includes a Peavey PVi4B 100 watt mixer amplifier two 10″ 2-way speaker enclosures with speaker stands two PVi100 handheld wired cardioid microphones and all necessary leads. Perfect for rehearsals small gigs public speakers houses of worship and fitness instructors the Audio Performer PA System is easily transportable and a breeze to set up. 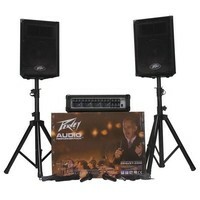 This entry was posted in Peavey and tagged PA-DJ-and-Lighting. Bookmark the permalink.